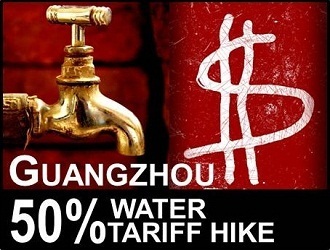 May 21- Guangzhou’s domestic water tariff rises 50% from RMB1.32/cu.m. to RMB1.98/cu.m. starting today. “Special category” water users which includes car washes, nightclubs, saunas and spas face ~500% increase from $3.38/cu.m. to $20/cu.m. Progressive water tariff hikes are expected be implemented in 6 months.